KW Expo Productions creates shows where attendees explore, discover and gain knowledge from quality exhibitors. They are provided with informative educational seminars and have the opportunity for unique experiences in their own community. We believe that it is important to educate the community of the variety of services and products that are available and connect them to the necessary resources in order to enhance their quality of living. We strive to foster an ethic of social responsibility within our communities and operate by the following guided principles: Professionalism, Authenticity and Organization. KW Expo Productions has made some transformations over the past 17 years. Initially entering into the market, in the year 2000, as a corporate concierge service (Cardinal Concierge), then transforming to a corporate event management company ( Cardinal Conference & Event Solutions), and in 2017, has rebranded to connect to its niche market as KW Expo Productions. 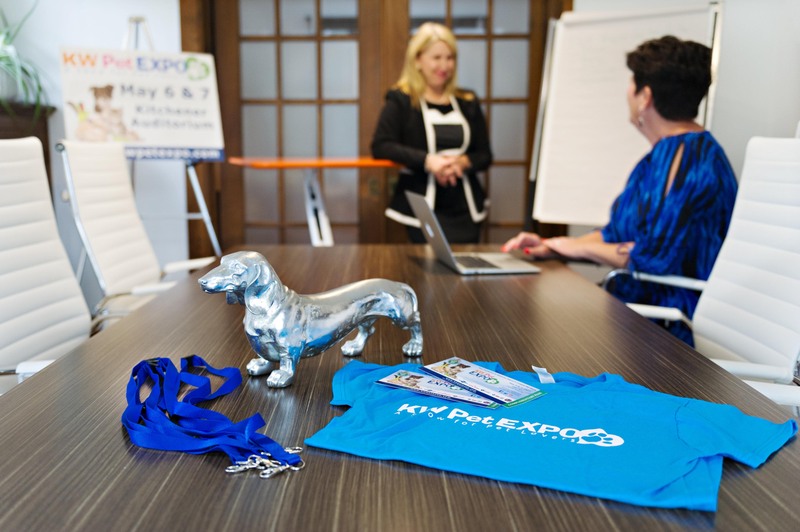 In 2016 we launched our first show called the KW Pet Expo, and launched a second show our called the KW Health Expo in 2018 which we are currently looking to rebrand and host in March 2020. Our team has over 50 years of combined experience in event management, human resources, legal and financial management, marketing and digital imaging. We are also a member of the Canadian Association of Exhibition Management giving our company a network of professionals with years of experience behind the scenes. Since we are a small company we have the flexibility to make changes to market needs and are able to provide customers with what they want quickly. Finally, we have passion—we love what we do! Our dedicated team of experienced professionals are looking to engage, encourage and connect with our community. We are standing by to serve your needs. Tina is the Founder and President of KW Expo Productions. She is a graduate in Event Management, Digital Imaging, Human Resource Management and Legal Studies. She is a member of the Canadian Association of Exhibition Management (CAEM) and has recently received her CEM (Certified in Exhibition Management) designation. Her role covers many areas including account management, promotions and show logistics. Tina is a life-long learner and you will often find her taking educational courses. In her spare time she enjoys yoga, musical productions, traveling Europe or skiing the Rockies. David has his Honours Bachelor Degree of Business Studies from IT Tralee, Ireland and is a graduate in Marketing and Radio Broadcasting at Conestoga College. His role is to assist in marketing strategies for KW Expo Productions. Also, with his technical skills, he manages all audio-visual requirements and is the voice for all our events. As marketing coordinator, David always has an out-of-the-box idea to engage our vendors and visitors. Marianne graduated with distinction in Event Management and has her Honours Bachelor of Business Administration from Wilfrid Laurier University. Marianne is also a member of Meeting Professionals International. Her role is providing accounting operations for the company and guides in financial decisions. When she is not crunching numbers, Marianne loves to cruise the Caribbean sipping a fruity drink, golf with her peers, or walk her dog Riley. We are always looking for professional, enthusiastic, and passionate people to add to our growing team. If you have what it takes to excel in the areas of public relations, event planning, social media or audio technician, send your resume to tplett@kwexpoproductions.com.